Let’s face it…long flights can be exhausting and test one’s patience to the very end depending on the circumstances. However, there are a few smart items that can be tucked away in a carry on bag that can make the journey far less stressful and even downright pleasant. Here are seven items not to leave home without. Never underestimate the value of a good pair of ear plugs and blackout eye mask during a flight. Whether a nap is order or the screaming infant five rows back is driving passengers crazy, these items can help block out that reality and help one snooze a bit, too. However, those who want to avoid engaging in a conversation with fellow passengers or simply ‘zone out’ for a while might consider bringing a pair of earbuds, as the ones on planes are often subpar. There is a condition that researchers have dubbed as airplane headaches, that can be atrributed to several aspects of the traveling process. Long lines at security checks, missed or cancelled flights, irritating passengers or over indulging in alcohol appear to be the most common causes. However, finding a pain reliever at the airport can be costly and challenging, and obtaining some in-flight may not be possible. Put some in a carry on bag, and be your own—or someone else’s—hero during the journey. Quite a few individuals take their shoes off on planes and walk around the cabin in their socks. Unless there’s a pair of socks that passengers can afford to throw away after the flight, it’s recommended to bring a pair of slippers or flip-flops to wear in-flight. There are quite a few slipper-sock hybrids out there, many of which feature fun characters that can liven up the adventure and make the kiddos more interested in donning them, too. In recent years, many airlines have begun charging exorbitant rates for in-flight meals and snacks, which are often only available on longer flights. Those who plan ahead, can simply reach in their carry on luggage and whip out a sandwich and chips, a healthy snack bar or other nutritiously filling snack. If kids are also traveling, bringing along some of their favorite goodies can be a godsend. Sure, there’s no plug in’s on the plane, but what happens if that next flight at the airport is delayed or those hotel reservations need a final confirmation after? Traveling with laptops and phones on airplane mode can actually cause the batteries to drain even if they aren’t in use, so being able to charge up at the airport terminal can be a lifesaver. Having copies of essential documents like passports or identification in the carry on is particularly important when traveling overseas or anywhere far from home. Digitizing personal documents is the easiest way to having them replaced in case a pickpocket targets travelers or if the originals happen to get lost during the journey. Don’t place them in luggage going through the conveyer belts, as luggage can also go missing and create a true disaster for travelers in foreign countries. 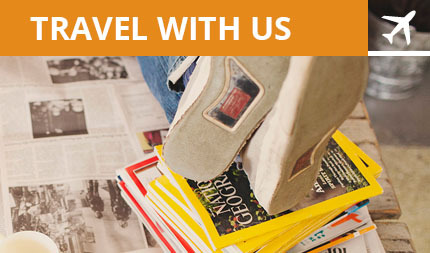 Looking for expert advice concerning your upcoming travel plans? Give us a call today for professional guidance.